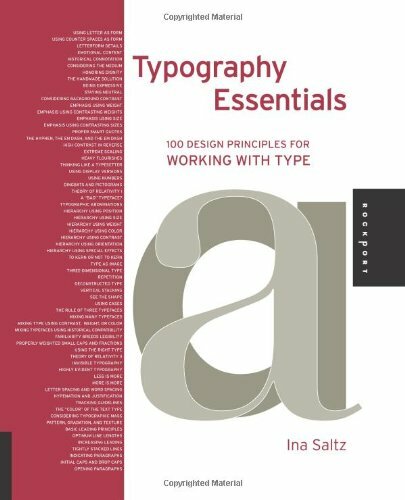 This book outlines and demonstrates basic type guidelines and rules through 100 entries, including choosing the typeface for the project, striving for rhythm and balance with type, combining typefaces, using special characters, and kerning and legibility. These essentials of type design are critical to the success of any job. Ina Saltz is an art director, designer, writer, photographer and professor (of Electronic Design and Multimedia at The City College of New York) whose areas of expertise are typography and magazine design. For over 22 years, Ina was an editorial design director at Time Magazine (International Editions), Worth Magazine, and other magazines including Golf Magazine, Golf for Women Magazine, and Worldbusiness Magazine. Ina frequently lectures on topics related to magazine design and typography, including Toronto, Atlanta, Denver, Moscow, Amsterdam and Calgary. She lives with her husband inï¿½New York City.